Breakfast is the meal that revs our engines and powers us through morning workout sessions, hectic commutes and important (or not so important) meetings. 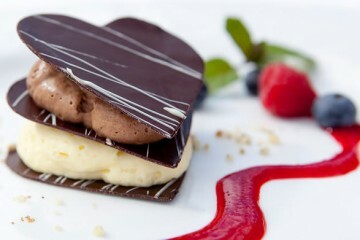 But let’s face it, sometimes breakfast dishes can resemble a decadent dessert, or they can just get plain boring. Smithfield, who was kind enough to sponsor this post agrees and wants breakfast to be reimagined. As much as I love to carbo-load as much as the next guy or gal, starting my day off with sweet or bread filled breakfasts can leave me wanting to do pretty much nothing. So lately, my favorite things to have for breakfast are high protein, whole food options that leave me feeling full and energized. But gosh, sometimes you just want a breakfast sandwich in the morning. 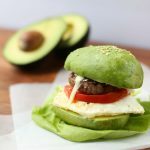 I love the idea of taking a classic breakfast sandwich and “reimagining” it with avocados as the buns for added protein and a healthier alternative to biscuits or bread. I probably don’t have to tell you that avocados have become all the rage lately. 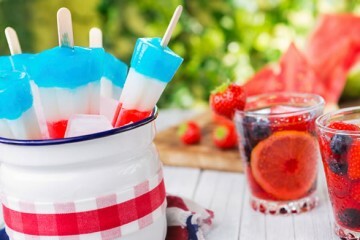 They’re everywhere and popping up in traditional dishes in some of the most unexpected ways. One of those “ways” is as a bun substitute. Yes, that’s right. If you’re a diehard carby bread lover you’re probably thinking this is going too far. And you’re giving me dirty looks through the computer screen right now. I get it. I really do. I’m one of you. But sometimes stepping out of the box is a good thing. So, while pondering how to update my beloved traditional sugar laden breakfast sandwich breads like bagels or rolls, I thought about what I could use instead that would not only be delicious, but also satiating and healthy. And since I’ll try just about anything food related at least once I figured why not try the latest trend: avocado buns. Rich, creamy and downright delicious, avocados are chock full of essential vitamins and minerals like vitamin B5 (pantothenic acid), B6, E, magnesium, phosphorus and iron. 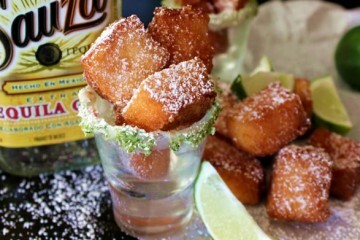 If you’re not into avocados we have another alternative. But for now, let’s get to the recipe. One of my favorite ways to eat an egg sandwich in the morning is with sausage. I love it. 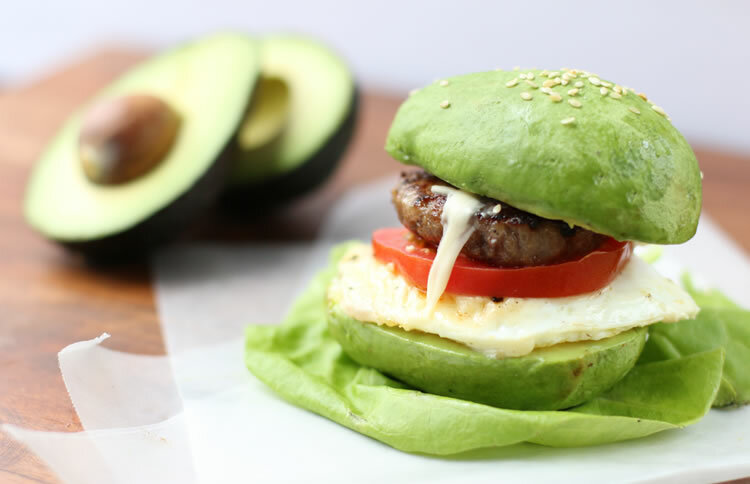 So this recipe for Avocado “Bun” Breakfast Sandwiches is made with an egg cooked over easy, melted white cheddar, a slice of red ripe tomato, and is topped with a delicious pan-seared Smithfield Hometown Original Breakfast Sausage patty. Bonus: they’re gluten-free, low carb and paleo friendly if you nix the queso. For my breakfast sandwich I used Smithfield Hometown Original Breakfast Sausage Patties. They also offer Bacon and Maple flavors which could give your breakfast sandwich (avocado “bun” or not) a nice flavor twist. Not only are they made with premium quality pork, but they’re also MSG free and gluten-free. You can feel good adding this breakfast staple to your plate and fridge. To prepare the avocado “buns” is easy. Just slice the avocado in half, remove the large seed inside and carefully peel away the outer skin. If you want your avocado “bun” to be able to stand upright on its own, pick out which half you want for the bottom and slice a small sliver straight off the rounded part. Then sprinkle the top of the “bun” with toasted sesame seeds for a life like real bun appearance. Add your egg (scrambled or over easy), sliced tomato and sausage patty on the bottom layer and place with your avocado bun top for the win. You can melt the white cheddar (or cheese of your liking) on the sausage patties while they’re cooking in the pan. 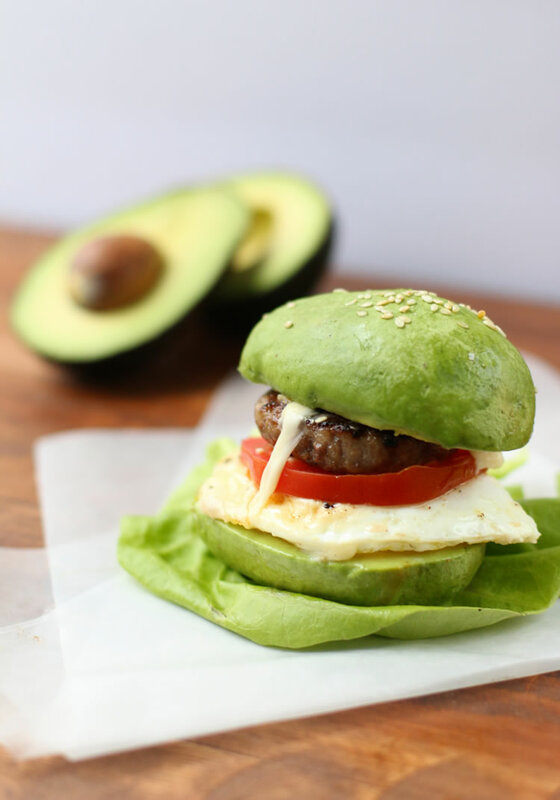 Get the recipe for Avocado “Bun” Breakfast Sandwiches! Looking for a low carb breakfast sandwich alternative? This recipe uses an avocado in place of a bun and is topped with eggs, white cheddar, sliced tomato and a Smithfield Breakfast sausage patty. 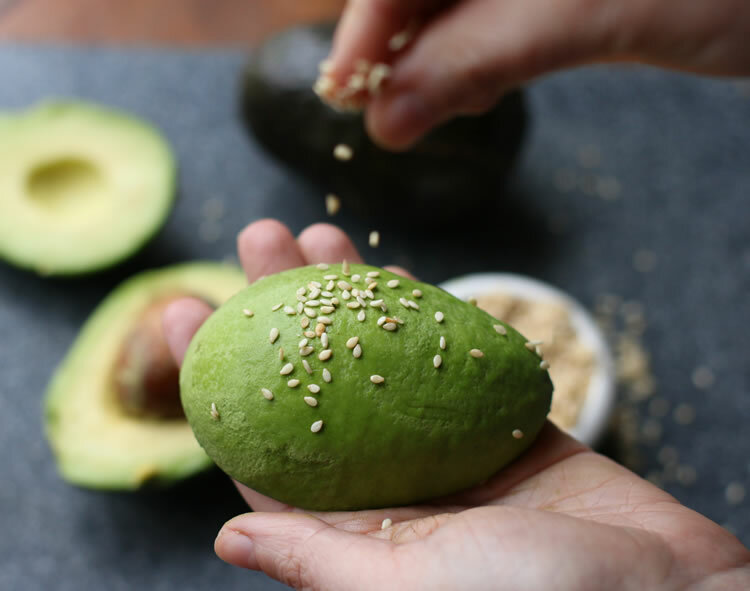 To prepare the avocado "buns" slice the avocado in half long ways, remove the large seed inside and carefully peel away the outer skin. If you want your avocado "bun" to be able to stand upright on its own, pick out which half you want for the bottom and slice a small sliver straight off the rounded part. If you like, sprinkle the top of the "bun" with toasted sesame seeds. Stove-top Method: Place the thawed breakfast sausage patties in a skillet over medium-high heat for 7 to 12 minutes. Turn frequently to brown evenly. Oven Method: Place thawed patties on a shallow baking pan. Bake at 375 F for 8 to 13 minutes. Turn patties over after 5 minutes. 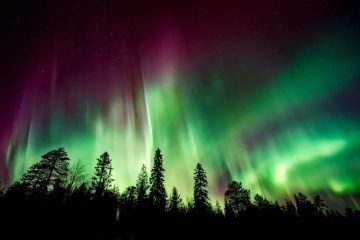 *The internal temperature of the sausage patties should reach 165 F when fully cooked. When the sausage patties are nearly finished cooking add the white cheddar until just melted. To assemble place your egg (scrambled or over-easy), sliced tomato and sausage patty on the bottom layer and place with your avocado bun top. Eat with your hands or with a fork and knife. Recipe Alternative: Sweet Potato "Buns"
Preheat oven to 400 degrees Fahrenheit (200 celsius). Peel and then slice a fresh sweet potato into 1/2 inch slices. For 4 servings (sandwiches) you will need 8 sweet potato slices. Bake on a greased pan at for 15 to 20 minutes until tender but not mushy. Assemble your breakfast sandwich to your liking and devour! Still not convinced avocados work as a breakfast sandwich bread substitute? That’s okay. Simply peel and then slice a fresh sweet potato into just under 1/2 inch slices. Bake on a greased pan at 400 degrees Fahrenheit (200 Celsius) for 15 to 20 minutes or until tender but not mushy. Assemble your breakfast sandwich to your liking and devour! These guys make the perfect little breakfast sandwich buns and pair perfectly with Smithfield’s breakfast sausage patties. Visit Smithfield.com for a variety of re-imagined breakfast recipes ranging from sweet like Bacon, Peanut Butter & Banana Toast to savory like Eggs Benedict with Sausage, balsamic greens & smoky orange hollandaise. *This is a sponsored post written by me on behalf of Smithfield.